Frequent itemset mining has been a focused theme in data mining research and an important first step in the analysis of data arising in a broad range of applications. The traditional exact model for frequent itemset requires that every item occur in each supporting transaction. However, real application data is usually subject to random noise or measurement error, which poses new challenges for the efficient discovery of frequent itemset from the noisy data. Mining approximate frequent itemset in the presence of noise involves two key issues: the definition of a noise-tolerant mining model and the design of an efficient mining algorithm. 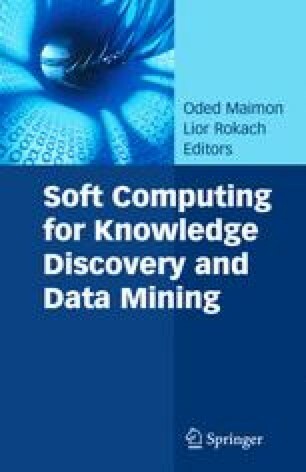 In this chapter, we will give an overview of the approximate itemset mining algorithms in the presence of random noise and examine several noise-tolerant mining approaches. FIMI: Frequent itemset mining implementations repository. http://fimi.cs.helsinki.fi, 2003. UCI: machine learning repository. http://www.ics.uci.edu/˜mlearn/MLSummary.html, 2007.